SAN FRANCISCO: For the past few years, Nissan Motors has been trying to break out of a veritable rut of slow sales and somewhat lackluster cars by designing and building more interesting and powerful vehicles. Let me introduce you to the new 2002 Nissan Altima. 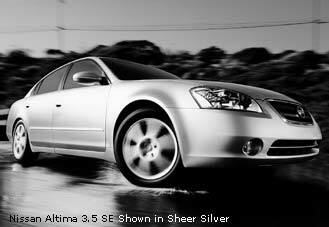 The companys first major effort of change was a redesigned Maxima, with sleeker lines and more power under the hood. It seemed that Nissan was breaking out of its mold with abandon. "Phase 2" is now successful with the introduction of the newly redesigned Altima. When we first saw the all-new 2002 Altima out in the open at the St. Louis County Fair last year we were impressed with what it has become: A large-ish car with interesting styling and more features, including a powerful V6 option, that could set the sedan class on its ears. lets just say we were impressed in a different way. As it is, for an extra $3000 above the price of our tester you can have either a new Maxima or an Infiniti I35, both with the same 3.5-liter V6, albeit with more power and many more features. That said, the new Altima is a balls-out blast to drive with 240 horses on tap and a "race-inspired" suspension. And dont forget about the disc brakes at all four wheels, with vented discs up front to keep the stopping power strong during heavy use. Trust us, we put the brakes and multi-link independent rear suspension to the test during our week with the Altima. We had almost too much fun taking the Altima through our handling loop in the hills outside of greater St. Louis. Through the corners and down the straightaways, we kept asking for more and the Altima kept on giving. This cars limits are at a point where most people will never go and thats a good thing. We felt totally safe cruising at hyper-legal speeds down two-laners that would scare an SUV into a slow crawl. That is, until a small squirrel crossed our path and brought us back down to Earth. With mortality rushing at us from all sides, taking a slower pace gave us a chance to admire all the new Altima has to offer. The eight-way power driver seat, covered in a nice cloth fabric, which should stand up well to years of fast driving, is a dream to work and makes it possible for anyone to get comfortable in. And, with the tilting and telescoping steering wheel, one should be able to easily find a safe, comfortable driving position in no time. a plus for those in cold weather climates. We particularly enjoyed the steering wheel mounted controls for the radio, climate control, cruise control, and more. Once we learned what functions each button performed, using them while driving was a cinch and let us keep both hands on the wheel. The only change we would like to see, on the whole car, would be lighted steering wheel buttons. Thats it, end of story. As a testament to the overall solidness of the new Altimas design and execution, it was voted the North American Car of the Year by automotive journalists attending the North American International Auto Show in Detroit this past January. An accolade well deserved for this totally new car from a reborn Nissan. to make getting in and out less of a chore. Actually, the extra length makes the Altima a longer, more manageable vehicle for everyday things like traveling down the highway or picking your friends for a night on the town. just to be safe. We found that, overall, the interior is one of the best on any under-$30k sedan out there. It is well thought out and functional, even if one passenger didnt like the modern flair of Nissans design team. Our Altima tester came with a gaggle of standard features and convenience items for a base price of $23,349.00. We were impressed with the number of standard features for the price and the value associated with these items. If you can imagine this, our Altima 3.5 SE came with the 3.5-liter DOHC V6 with continuously variable valve timing, liquid-filled engine mounts, four-wheel disc brakes with vented discs up front, dual exhaust with chrome tips, 17 -inch wheels covered with P215/55r17 Bridgestone tires, remote keyless entry, four cupholders, driver and front passenger auto down (and up) electric windows, tilt and telescoping steering wheel, eight-way power drivers seat, air conditioning and cruise control, speed sensitive automatic volume control for the radio, and a trip computer with outside temperature. And those are just the tip of the standard equipment iceberg.